Step 1: in the first place, you need to enable on your Android the possibility to download applications from unknown sources. This option can be found in the settings menu of your device within the Applications option. Step 2: download the APK file from any of the sources available. You can do so from Malavida (through the green Download button and following the steps indicated to download the file), from the project’s official website or from alternative app stores to Google Play of the likes of Aptoide or APKMirror. Step 3: once downloaded, you have to your download folder. On many devices, whether smartphones or tablets, this kind of file is differentiated from other downloads so it’s easier to find them. Step 4: once you’ve located the file, simply tap on its icon. Follow the steps, accepting each one of them to be able to complete the installation on your device. Finally, you can choose whether to remove the file after the installation or to conserve it, which is totally up to you, and doesn’t affect the functioning of the app at all. Step 5: now you can go to the Applications menu and be able to see the application in it just like any other one you may have downloaded and installed on your device. 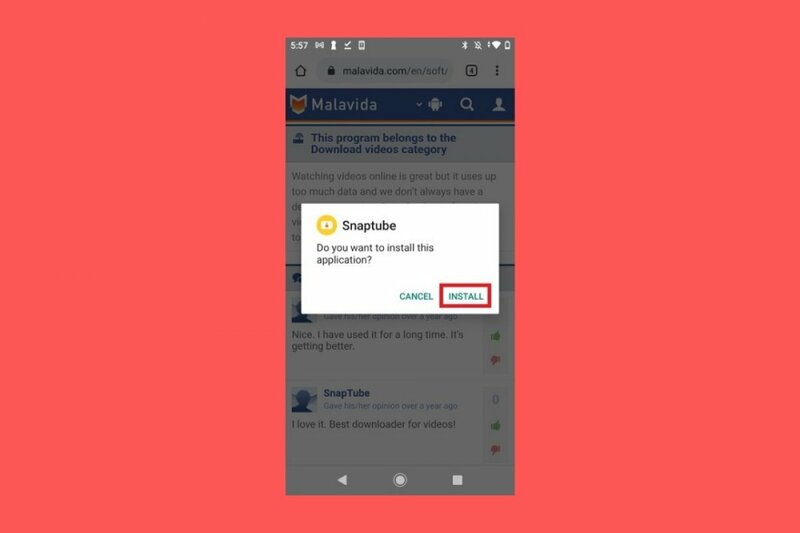 As you can see, installing SnapTube is extremely simple: you only have to download the APK file and tap on it to let our Android operating system take care of the rest. You won’t even need a rooted device to get it running.